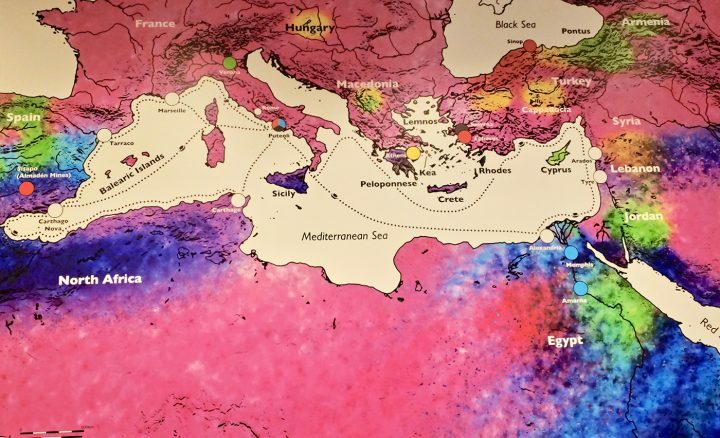 A new exhibition at University of Michigan’s Kelsey Museum of Archaeology dives deep into the material and application of pigment and in doing so highlights a colorful, international history. “He thought that the university might benefit from having an excavation, because he wanted to know more about the context of these things,” said Catherine Person, Ph.D, the museum’s educational and outreach coordinator and co-curator of the exhibition, along with Carrie Roberts, the museum’s conservator. While Person’s archeology expertise helped to ground the show in a historical context, it was Roberts who happened upon the show’s inspiration in the course of her conservation work. The funereal portrait that sparked Roberts’s initial interest in pigment research; she later established that that larger areas of the painting featured less expensive pigments, but some of the most precious, pink and blue pigments that together created a purple effect, and cinnabar, were used to render the small jewels, making their use even more sparing than the real gold leafing. Roberts’s initial inquiry centered around two objects on display: a small, exquisitely detailed funereal portrait of a woman, and a statuary head of Bacchus. In the case of the former, there was much evidence to work from— not only was the portrait well-preserved, but Roberts was able to sample microscopic bits of the pigment to test her hypothesis about the types of dyes and pigments used to color the woman’s garments and jewels in the rendering. In the course of establishing results from her findings, Roberts also employed a light-spectrum test that enabled her to analyze objects for the presence of rose madder and Egyptian blue pigments — an especially useful trick for the analysis of the Bacchus head, which did not have enough pigment present to physically sample. 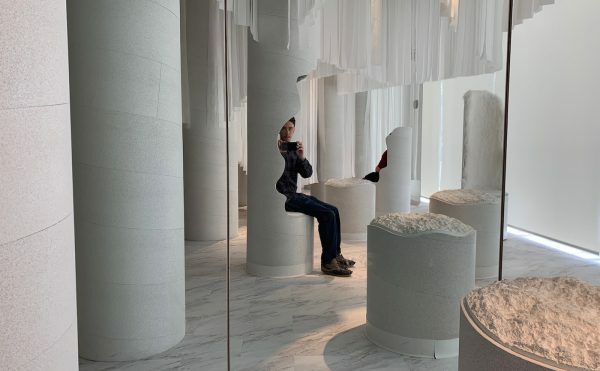 Interactive stations within the exhibition enable visitors to replicate the light tests that reveal the reactivity of certain substances, like rose madder and indigo, while also affirming the presence of nonreactive colors, like cinnabar and Egyptian blue. We noticed in this guy [the Bacchus head] that we found traces of red in the hair of the sculpture, and Carrie wanted to know if it was something that had stained the marble after it was buried, or rose madder. She shined a UV light on it, and the hair didn’t glow, but the leaves did. Alongside the artifact on display are two renderings of the Bacchus head in color, one which remains entirely faithful to only those pigments that were confirmed as part of the statue, and another that imagines a more complete job of coloring, involving pigments that speculatively wore completely away over the centuries. Pigments in distilled form, as well as samples of ancient fibers still bearing evidence of their colorful dyes. A large portion of the exhibition is devoted to the presentation of such pigment materials, from the common pink derived from extract of rose madder root, which grew wild over a huge portion of the region, to the elite Tyrian purple. This pigment could only be created through the extraction of a certain gland from thousands of aquatic Murex snails, which then needed to be boiled for some ten days to create the rich purple dye matter (as well as a horrific odor). A dazzling spectrum of dye colors and materials are showcased, first in their naturally occurring sources: minerals for malachite green, yellow ochre, and the elite bright red cinnabar; leaves for indigo and roots for rose madder; carbon black, and chalk, and lead white. Then they are shown in their distilled forms, extrapolated into powder pigments or dyes. 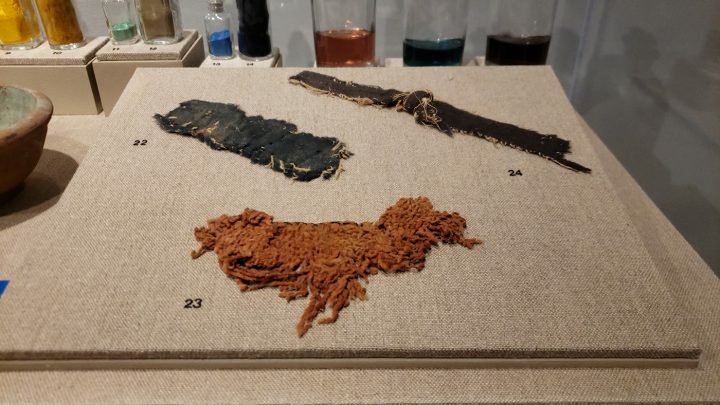 The exhibition gets into fine detail about everything from the making of these colors —including the process for creating Egyptian blue, generally considered to be the world’s oldest synthetic pigment — to the importance of color as a social and status marker. It also describes all the places in the Roman world where one might have encountered these pigments, from dyed fabrics and baskets, to painted building facades, and even cemeteries. A tombstone from Italy, with the inscription picked out in red paint. It was not permitted to bury the dead inside city walls, so tombstones like these lined the major thoroughfares in and out of cities, pronouncing the names of the dead to all who passed. 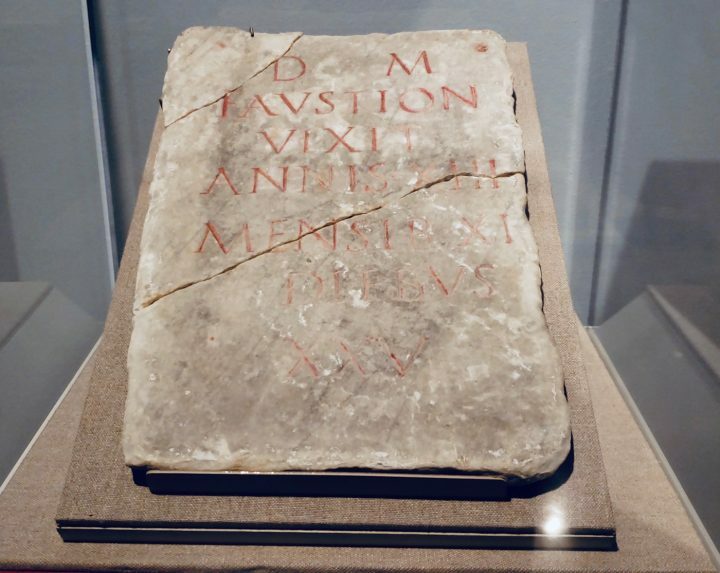 “In the Roman world, in Italy and in Egypt too, when people died their tombstones were usually painted bright colors, because they wanted people to read their names and remember them,” said Person. So as a poor individual, maybe you can’t afford that, but you would still encounter a cemetery where you would see that color and engage with that, too. The color seems to be all over the place. Installation view of watercolor reproduction of the Ville of the Mysteries, Pompeii, by Italian artist Maria Barosso. 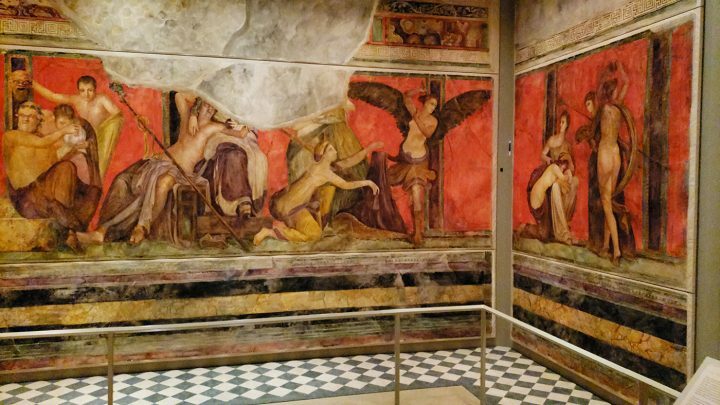 The pièce de résistance of the exhibition is the set of watercolor reproductions from the Ville of the Mysteries in Pompeii, a reproduction of the frescoes still in place there, commissioned by Kelsey in 1924, because he wanted his students to experience what had just been discovered in Italy. He hired Maria Barosso to make the watercolor panels. On display are both the first rendering she did as a sample, which was deemed a little too big, and in a separate area, an entire dining room chamber reconstructed at 5/6 scale. Before the work was allowed to be installed the United States, they put it on display along with other works of Barosso’s in Italy in 1927, thus creating the first retrospective of a living female artist ever mounted in Rome. Ancient Color manages to offer a serious take on the social context, visual intensity, and international commerce of pigment in the ancient world, without losing the fun of its subject. 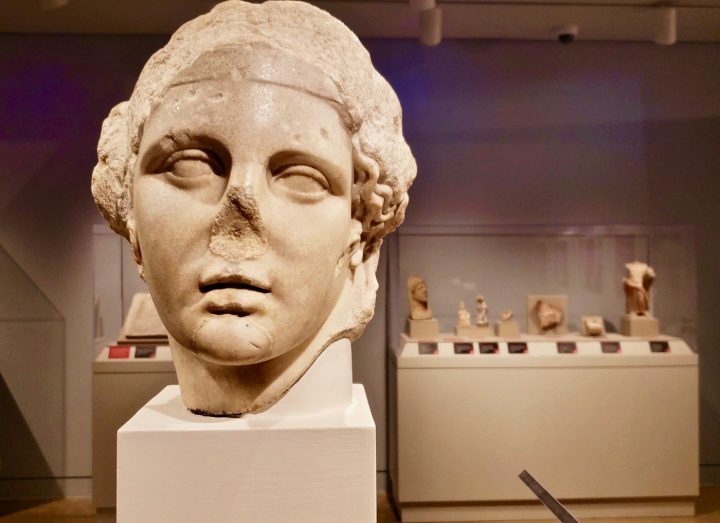 It’s one of the rare opportunities to view history that has been long resigned as the purview of archeology, in immediate, artistic, and vivid color. 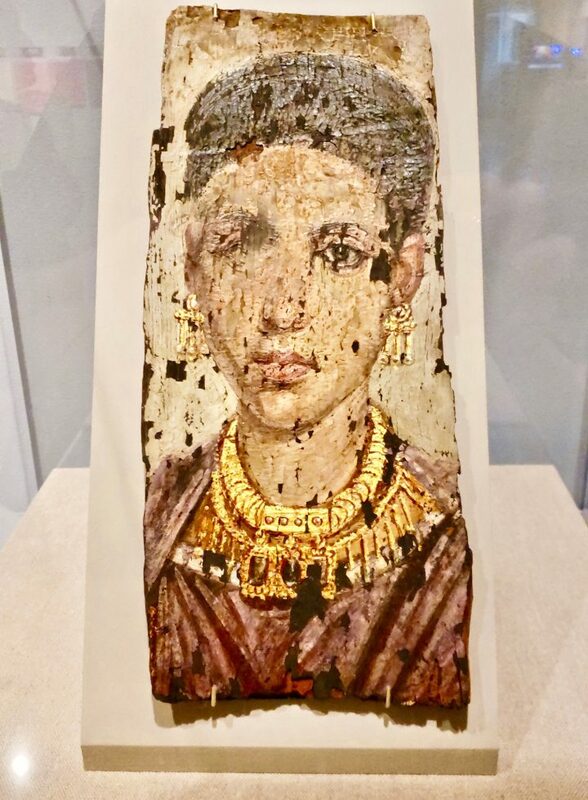 Ancient Color continues at University of Michigan’s Kelsey Museum of Archeology (434 South State Street, Ann Arbor, MI) through May 26. It was curated by Catherine Person and Carrie Roberts.